Link4Life is passionate about providing equal opportunities to sports and leisure activities in the borough of Rochdale. A chance to get fit, compete, meet new friends, get out the house and provide a great way to improve health and quality of life irrespective of levels of ability. Have a read through what we offer and get in touch! Link4Life offer a wide range of accessible activities in and out of school time and during the school holidays. One of our success stories is Sunsport which has been delivering high quality activities for over 13 years. Programmes are tailored to suit the needs of young people offering exciting and enjoyable environments with the opportunity to participate, develop and progress. Link4Life understands the importance of offering new activity opportunities but also recognises the value of supporting continued participation into adulthood. Activities are excellent for health, fitness and strength but can also play a key role in maintaining valuable friendships. 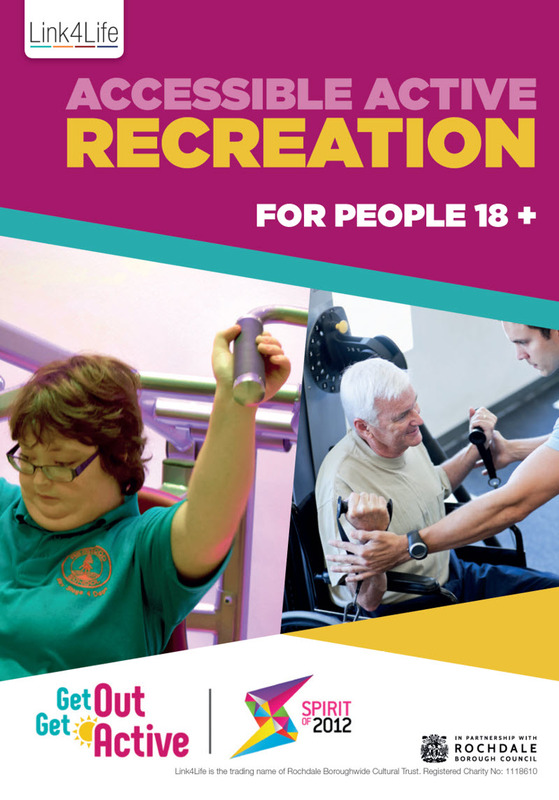 Link4Life offer a broad range of activities tailored around the different needs of adults. Hollingworth Lake Water Activity Centre are offering a wide range of exciting activities for young disabled people aged 8-19 years. Disability will not be a barrier. Come and have a go at Canoeing, Sailing, Archery, Camping, Rock Climbing, Biking, Canal Journey, and an opportunity to do a residential adventure. All4Sport involves a series of school events for disabled school pupils, providing a pathway to increased opportunities for elite achievement. Participants take part in sports such as athletics, boccia, and football. Those who demonstrate high performance are selected to take part in regional, county and national games. The programme is part of the national School Games programme and pupils are entered via their schools. No booking is required as this is coordinated through schools. Go4it and Link4Life's Disability holiday programme Sunsport have joined forces over the holidays and will be putting on a sports session for disabled and non-disabled young people one day a week. With fully qualified sports coaches and support workers delivering on the programme, this is a unique opportunity for children of all abilities to come together and have fun – Because You Can in Sport. Link4Life's Inclusive holiday sessions will once again take place over the school half term. There will be plenty of sports, games and activities on offer throughout the day. Suitable for children of all abilities aged 8-14 years. This weekly session uses accessible bikes to create a friendly and social environment for disabled people aged 19 years and over. No need to book – this is an open drop-in session at Bowlee Park Sports Centre. Sports club sessions supporting young disabled people aged 8-19. You will need to bring your own powerchair. We will provide you with the powerchair football attachments. Arrive at 4pm for fitting attachment - assistance will be provided. Training 4.30pm-5.30pm. Sessions adapted to suite peoples abilities. This session invites young disabled people along with their friends and family to take part in a range of coached sport sessions. Selected weeks will involve guest club coaches, where participants have the opportunity to try sports provided by their local club providers. No need to book – this is an open drop-in session at Rochdale Leisure Centre. Click here to download the Inspired Sport timetable. We offer a wide range of activities in various facilities across the borough including Football, Dance, Cricket, Rock Climbing, Canoeing, Fishing, Golf, Dodge Ball and lots more. All sessions are delivered by qualified coaches and supported by a team of support staff. Follow this link to book SUNSPORT online. Click on the image below to view or download the digital booklet.